In November we continued work on the elevated water tank. We painted the water tank and the trestle supports and assembled the superb brass etched detailing kit we had purchased from Peter Boormans Workshop. We enhanced the water tank further with a Uneek ladder, and used styrene rod to represent the water filling pipe and drain pipe. The tank assembly was glued to 9 small square pieces of styrene to represent the concrete footings. The whole thing was then painted and installed on the layout. A false floor was installed inside the tank using styrene sheet, and this was topped with a thin layer of coloured resin to show the tank as being near full with water. 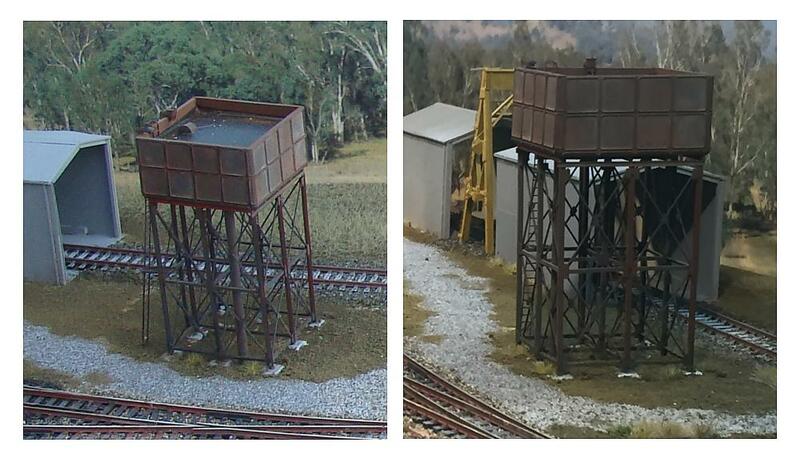 Two views of the completed, painted and detailed water tank installed on the layout. Many of the other items we had purchased at the AMRA NSW exhibition at Liverpool on the October long weekend were also worked upon. The water column from Uneek was assembled and painted and installed just off the country end of the Down island platform. 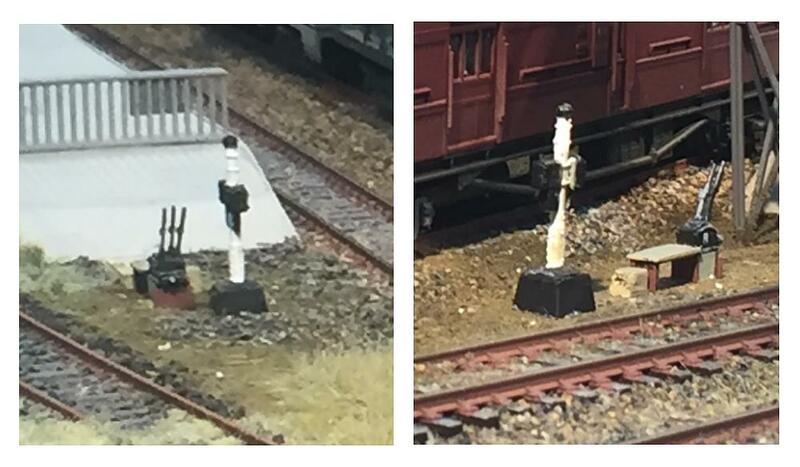 The goods yard phones were painted and installed, and the point levers were assembled and painted. A 2-lever frame and a phone were installed at the Sydney end of the Down island platform and a 3-lever frame and a phone were installed at the country end of the Up platform. Goods yard phones and lever frames near the platforms in Goulburn yard.